Javier Cervantes, left, and Graham Kislingbury of the Human Relations Commission appear before the Albany City Council Wednesday night. Over the last few months, according to its minutes, the panel has talked about getting the wording changed, and this came up before the council Wednesday. Councilman Rich Kellum objected to the addition of what he called “buzzwords.” He also complained that Javier Cervantes, chairman of the commission, had reneged on a deal that he, Cervantes, would notify Kellum anytime he wanted to bring something to the council. When Sykes took office in January, it was up to him to appoint a member of the commission as Cervantes’ term was up. 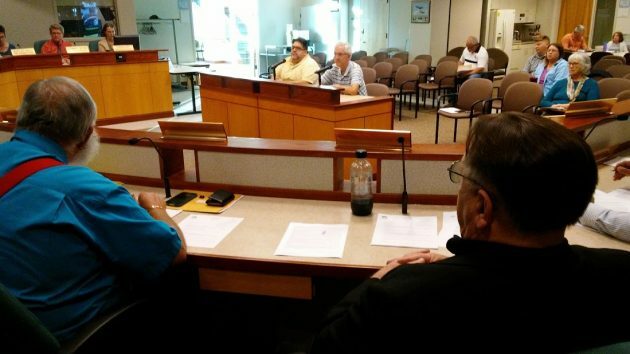 He named someone else, and according to the two councilors, commission members raised a fuss. Kellum also had an open position on the panel, and after a meeting with Kislingbury and Sykes in Sykes’ office, he agreed to appoint Cervantes to smooth things over. That’s when, Kellum says, he asked Cervantes to give him notice when matters would be brought to the council so members could think about sensitive issues ahead of them being broadcast on cable and online. It takes unanimous council consent to pass an ordinance at the same meeting when it’s first proposed. The upshot Wednesday: Kellum, Sykes, Bill Coburn and Bessie Johnson withheld their consent, so action on the changed wording was postponed till the next council meeting July 12. This story is troublesome at so many levels, I’m surprised Hering even touched upon it at all. In 2007, for a brief period, I was appointed to this very same commission. For the first few meetings, I remained quiet, hoping to learn. Then, at a particular session, the topic of Albany PD and the possibility that racial profiling might be happening as police decide on who to pull over at traffic stops came up for discussion. Out of simple curiosity, I posed a question. Does anyone at the APD or at the City track the racial background of drivers APD pulls over? I was told by the Commission Chair that the then-police Chief had already told the commission that Albany did not track racial backgrounds on their traffic stops and anyway, Albany Police don’t racially profile in the first place. In short, the Chair, at that time, of the Albany Human Rights Commission essentially told me this issue was not open for discussion because the Chief said there’s no problem. At that time, there were only Caucasians on the commission. I thought it odd that a City-chartered commission on Human Rights wasn’t interested in discovering whether profiling may or may not have been taking place in Albany. Nobody knew the facts, yet the commission was ready to pass judgement based solely on the word of the chief. The commission’s unwillingness to examine something as prevalent as racial profiling was shocking. I resigned from the commission the next day. Here are the so-called buzzwords which apparently cut to Kellum’s core. That Kellum would view these words as “buzzwords” really means that Kellum is not interested in the concepts touched upon by the words. Kellum is not interested in Albany being inclusive. Kellum is offended by the idea of equity in Albany. Kellum thinks diversity is little more than a catchphrase, unimportant in any discussion as to what kind of community Albany should be. This prior restraint amounts to likely illegal pressure from an elected representative who’s attempting to control the flow of ideas. Hardly the kind of leadership a democracy requires. Kellum’s heavy-handed, ham-fisted approach might work in a welding shop, but not in a democratic society. Cervantes ought to consult with the City Attorney about Kellum’s brutish actions. One can only imagine how much prior restraint Kellum would apply if he learned his actions were under consideration by the Human Rights Commission. Lastly, are City Council members so inept that they can’t talk about a subject without prior warning. It would seem, with the Council’s lack of action and Kellum’s rear view vision, ineptitude runs wild. Many thanks to the three who stopped the ordinance. The question should be “for what purpose” or “what is the goal” of the proposed word change? Diversity means many different things to many different groups. It could mean we want a sanctuary city status so we can all just “get along”. I don’t want that. Seems a commission member wants to forcefully hang on & push his agenda. Then he’ll want to push for this, push for that..it’s a slippery slope as demands are made under the guise of diversity & inclusion! I’ve had enough of “minority” groups making demands. For once a council member stood his ground. That meddlesome commission needs a new member! Buzzwords? Just like this loose collection: Make America Great Again. Never defined yet an easily heard dog whistle. The proposed language change is *very* innocuous IMO. None of it is inherently “buzzword” fodder. The language baiting was entirely 100% Rich’s commentary… And, Javier was not there alone – other members of the committee were also there – and concurred. As Javier said, it’s “evolving.” Very true. However, I, you, Rich, etc., can never understand the perspective from which it’s coming. If we all did, we’d never need the HRC in and of itself in the first place. Side note to the discussion was Rich’s comment about “advocacy” vs. advice (to council) from the committee. I’d suggest that if any of our commissions and/or committees do not advocate from their viewpoint, they are not doing their job. I was close to jumping in with the advocacy comment being akin to the TLT committee. While I didn’t/don’t like the outcome of their work, I totally agree with their passion (advocacy) for the task they had. Pabulum & rubber stamping pre-conceived notions doesn’t work. To answer hh, the commission members need to be such and such, but the commission itself does do have that mission. THEY Would Wish THE COMMISSION WOuLD Also Be SUCH AND such. Well, Hartman’s analysis sounds pretty solid, particularly with Ray K’s addition. Sounds like Kellum’s personal beliefs ran ahead of his position. By requiring personal notification about upcoming issues, he’s inserting himself into a power position that’s not in his purview. What in blazes are people afraid of?? I’ll take a stab at that centrist. Folks are shaking in their boots about losing their “whiteness” one generation at a time. Ironically, Oregon is not very diverse compared to other states so such a “loss” will take much longer than we can grasp. To “require” a committee chair to clear proposed changes, etc., before being presented to the entire council is pure and simple bullying! The Albany City Council is mostly filled with people who are what they believe of themselves “the movers and shakers” in Albany. IMHO, nothing more than big fish in a very tiny pond! An empty exercise in political correctness. So sick of special treatment, recognition, and other perks for people who just can’t grasp the concept of assimilation. Shall we just declare sections of the park as Asian, German,, Irish, Polish, African, etc? It’s a PARK, not the U.N. It was intended for ALL our residents. Just to be sure we’re clear: There is no current proposal or controversy involving any park. The flap over a park was more than 10 years ago. It seems whenever “diversity” is mentioned it just means “get the white guys out of the picture”. As long as you have ANY ethnic group thinking they’re special, it’s racism. It seems to me that Oregon has been about “get the people of color out of the picture” for quite sometime. I am more than disappointed in Mr. Kellum’s view and other’s statements that I read here. However, I am not surprised. The “white guard” is indeed feeling threatened as people of color have been for many years. Change is difficult but change must happen or we will stagnate. One need only view Rich Kellums Facebook page to see he views the world as a right wing whack job. Seems to work PERFECTLY well for the ..ah…ahh… pResident tRump. No? 1. You don’t have the guts to use your real name. 2. You live in Corvallis, which explains why you want to be so meddlesome. 3. Trump beat a BIGGER whack Job! Why not devote yourself to cleaning up your own mess? How does one know you use a “real name”? Don’t live in Corvallis btw. AND one more thought “william” a female Clinton Presidency would have been fully functioning. This feces show is malignant! Enjoy the show but buckle up! As Dear Abby would say “Kwitchurbitchen.” They are just different words with the same meaning. Really makes those complaining look petty and silly. Hot diggity! There is a term for this affliction. Thank you internet! Broflake: Straight white male offended by any feminist or ethnic activity which is not directly designed for him. Just to prove I didn’t make it up.